Enjoy a day in this famous city discovering in each famous district something that only the locals know. Miami is a big city with lots to do and see. Beaches, clubs and museums are always crowded with people, and are more expensive because of their popularity. But with this tour you will discover some of Miami’s best kept secrets that only locals know about. You will walk in famous places but you will see them from a different point of view. It may be a young city, but Miami’s history is rich in artistic abundance and cultural development. All over the city, in between the sand and the winding highways, are secret spots even locals don’t know about and our local guide will show all of them. The tour will start at your hotel where you will meet your driver guide. Begin with a stroll along the promenade, immerse yourself in the vibrant atmosphere of Ocean Drive and admire the pastel colors of the Art Deco buildings. Finally, the walk to the Bayside Marketplace took place, in less than an hour, now you will head to the Design District, 18 blocks dedicated to interior design, art, high fashion and design. Your guide will have many stories to tell you. Before leaving the Design District, you will visit the famous Wynwood Walls, a tribute to the major exponents of international street art. Your next stop will be the Vizcaya Museum and Gardens complex consists of a majestic European-style villa surrounded by 4 hectares of gardens inspired by the Italian and French Renaissance. A short drive will take you to Coconut Grove where, in addition to admiring the stores, you can enjoy an outdoor meal in one of the many local restaurants and try local specialties. In the afternoon it's time for the quaint neighborhood of Little Havana to buy hand-rolled cigars and drink a cup of coffee with milk (coffee and milk). Then proceed to a domino park and watch small groups of Cuban elders trying to challenge each other in a domino game. 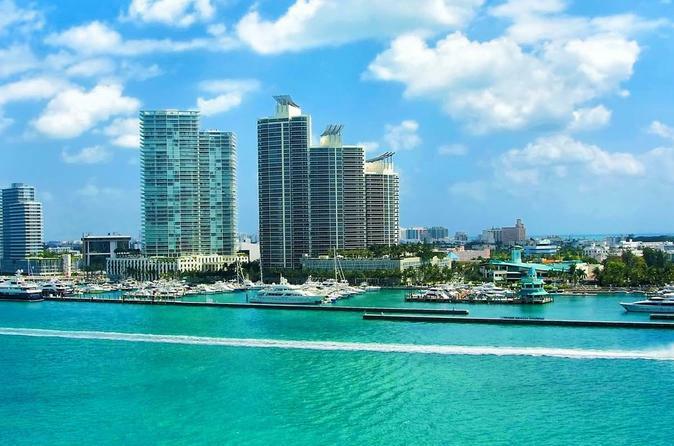 Return to South Beach towards Lincoln Road and the nearby Española Way, where you will find shops, restaurants and bars. But do not forget to see the prestigious art galleries, including ArtCenter, South Florida and Britto Central. At the end your guide will drop off you at your hotel.